Hotelmarketing.com recently published a very good article by Daniel Edward Craig. I am republishing it here on his behalf as this is information that many hoteliers should have. I have been doing these steps with my hotels for a while with lots of success. These days, bashing online travel agencies has become a popular sport. The likes of Expedia, Travelocity and Priceline are being blamed for commoditizing hotels, for decimating rates, and for training travelers to demand deep discounts. We can probably find a way to blame them for that oil spill in the Gulf of Mexico too. Not that OTAs need defending, but the reality is, we as hoteliers share the blame. It’s our signature on OTA agreements. We give them access to inventory at heavily discounted rates. And we’ve taught travelers to look for the best deals on OTA sites. Case in point: While reserving a hotel in Chicago last month, I found six different rates for the same room. The lowest came from Expedia at $180. Inconceivably, the highest rate came from the hotel’s in-house reservations department at $229. Such rate disparity is rampant. What started as casual use has become an unhealthy addiction. Meanwhile, while hotels are staggering toward recovery, the OTAs are boasting enormous growth. It’s time to take back some of the control we relinquished during desperate times. To that end, here’s a ten-step program for easing your hotel’s OTA dependency. 1. Admit you have a problem. The OTAs are not the cause of the discounting problem, but they are enablers and your competitor hotels are codependents. By advertising heavily that they offer deeply discounted rates, OTAs have contributed to the firesale mentality among travelers. Hotels have exacerbated the problem by being always on sale, by offering discount rates on discount rates, and by treating all inventory as distressed inventory. 2. Do the math. Yes, OTAs can move a lot of inventory, but at what cost? The terms of OTA agreements vary, but typical commissions range between 15% and 25%, with big-box chains paying the least and small independents the most. At $200 per night for a three-night stay, an independent pays $150 in commissions. Compare that to the low-to-zero costs of direct bookings. How could you use the difference to attract more lucrative direct bookings? 3. Don’t overestimate the billboard effect. No question, OTA business is an important part of the market mix. As Mike Nelson, president of Partners Services at Orbitz, explained on Tnooz.com, “In any economic climate, online travel companies are a strategic resource for hotels that want to stimulate demand, access a global distribution platform and benefit from vast marketing and promotional investments.” But to rank high on OTAs you must offer deep discounts. As powerful as the “billboard effect” is the “OTA effect” of training travelers to book via third parties. 4. Make direct the best option. Travelers should get the best deals by booking direct, period. Honor your rate parity agreements, but implement a best rate guarantee and clearly state the advantages of booking direct, like Marriott’s Look No Further™ promise. As an added incentive, offer value-adds not available via non-direct booking methods. 6. Use social media to connect with travelers. Private sales via members-only sites like Jetsetter and Vacationist allow you to bypass OTA rate parity requirements, but the terms can be even less favorable than those offered by OTAs. Use them sparingly to create base and sell off distressed inventory. Focus your efforts on social media and reputation management to build your email database and Facebook and Twitter followers and save your best deals for them. 7. OTAs are partners and competitors. OTAs don’t care which hotels travelers book as long as they book through them. Traditional travel agents charge 10% commission and provide personalized service in bricks-and-mortar offices. How can OTAs justify such high commissions, and where does the money go? Seen the TV ads, the cost-per-click ads, the print ads and banners? They’re driving up your advertising costs and luring travelers from direct channels. Goldman Sachs estimates that OTAs generate 8% to 10% of Google’s gross revenue worldwide. 8. Leverage your power. Competition among OTAs is fierce, and they need access to your inventory at competitive rates to compete. In an interview with the Chicago Tribune, Priceline CEO Jeffrey Boyd said, “You’ve got to have the best rate, and the hotel has to be available when the customer is searching on it.” Leverage this power by negotiating the terms right for you. According to revenue management consultant Jil Larson, that means “either block space or last room availability but not both.” If the OTA won’t come to terms, find one that will. 9. Loyalty means loyalty. Loyalty program members who book via OTAs must understand that they’ve forfeited their perks to the OTA in the form of a hefty commission. Stipulate that members must book direct to qualify for privileges. This is especially true of opaque sites; booking blind isn’t brand loyalty. 10. Make the booking experience seamless. OTAs are brilliant marketers and are constantly improving the consumer experience. How does your booking experience measure up? Is your website mobile compatible? Make voice reservations accessible, efficient and personal – an area where OTAs can’t compete. And invest in a two-way PMS interface to decrease time spent managing rates and inventory and free up time for strategizing. As for that hotel in Chicago, I asked them to match the Expedia rate. They agreed, so like a good hotelier I booked direct. Don’t make your guests jump through the same hoops. 1. When clicking on a hotel’s photo in Tripadvisor the browser is immediately directed to Expedia whether the hotel has signed with Expedia or not. The hoteliers argue that it should link directly to the official website of the hotel. 2. Expedia sometimes promotes wild discounts such as 75% off without agreement from the hoteliers. And if there is no availability on a hotel. Expedia will still promote the hotel but direct the browser to another hotel thus using the hotel’s popularity to sell other properties. 3. Hotels.com seemingly dissuades users to book directly at the hotel’s website. These are some of the main points I could understand from the article (see the original article in french here: http://www.zdnet.fr/actualites/internet/0,39020774,39750958,00.htm). If this case will win or not is uncertain however a few points are clear. Expedia’s model of taking 25% of a hotel’s revenues isn’t appreciated much longer and despite their size, more and more hoteliers aren’t willing to give that type of money to a third party. Secondly, Tripadvisor will need to open up and become a fully fledged social media. The fact that it is owned by Expedia isn’t going to do Expedia a favour anymore as it may just soon be faced with an anti-trust problem. It is only logical that Tripadvisor favours hotel’s official website. There was a step in that direction this year with the sale to hoteliers of a link to the official website. Thirdly and most impotantly, websites like Expedia, Booking.com and others all the third party booking systems have a limited future unless they really start to help hoteliers. At the end of the day all they are doing it offer information to the internet users, but charging a huge price for it. Shouldn’t the information be free? Google seems to be making an entry into the field with rates noted on the Google Maps. Expedia already makes no money on flight tickets… so their only real solution now is going to be to work out a way to give some real added value to hoteliers. When I built WIHP there was one thing that I knew I had to do from day one and that was HELP hotel’s increase their profits. It has worked wonders so far making us the incontestable leaders in the Paris market. Let’s see how this pans out. TendanceHotellerie.fr is a French website for hoteliers, they do news and information about the French Hotel Industry and it’s a clean look and fell. Vincent Rajjoo one of the editors there recently interviewed me and I thought I would publish the link. It is mainly for les Francais but if you’re interested you could translate it with one of the online translation tools. Quelle a été votre activité avant de commencer WIHP / Lookotel ? Avant de créer la Société WIHP et le produitLookotel.com je faisais partie en tant que co-fondateur de la société 1001webpromotions. Et avant cela je travaillais avec une des premières sociétés qui offraient des services internet à Paris. Comment décriveriez-vous WIHP / Lookotel ? Nous avons plusieurs produits. WIHP Sites web, Lookotel.com et WIHP Gestion. WIHP Sites web est le leader en termes de création de sites web pour les hôtels indépendants sur Paris et probablement en Europe. Nous n’offrons pas des « sites web » nous procurons des réservations aux hôteliers à travers un site performant. Lookotel.com est un portail unique en Europe dans son genre : sans commission pour les hôteliers ! C’est un grand avantage d’avoir une telle puissance de feu pour faire la promotion de son hôtel à grande échelle. Tous les frais son fixes pour hôtelier. Le but est de faire des réservations en direct depuis le portail ou d’envoyer les clients vers le site officiel de l’hôtel. WIHP Gestion : notre équipe de professionnels de l’hôtellerie s’occupe de commercialiser une trentaine d’hôtels sélectionnés. L’équipe prend un hôtel et le « booste », en utilisant toutes les possibilités de distribution, les réseaux sociaux, l’amélioration de la décoration de l’hôtel, et de la qualité du service à travers une formation très pointue. Ils gèrent un hôtel sur 6 mois minimum avec une promesse de résultats. WIHP / Lookotel en quelques chiffres ? Lookotel : 1 visiteur sur 3 qui voit votre hôtel sur Lookotel.com va cliquer sur votre site. C’est une augmentation de 500% du nombre de visites sur 1 an avec un choix de 250 hôtels sur Paris pour l’internaute. WIHP Sites web : c’est plus de 15 000 réservations en ligne par mois sur Paris seulement. Et ce sont des sites qui doublent le taux de conversion visites/réservations depuis la mise en ligne des sites de dernière génération. Et ce n’est pas un hasard – ce sont des centaines d’heures de programmation pour créer un système « analytics » qui nous aide à mesurer la vraie efficacité de nos sites. Comme je le disais nous n’offrons pas un « site web » mais de la réservation et en volume. Quelles sont les différences entre WIHP / Lookotel et d’autres sociétés de création web ? Notre différence est que l’on prend soin de mesurer l’efficacité de nos sites en détails ; nous avons des outils que l’on a développés pour cela et on arrive à isoler le problème exact pour chaque site et s’assurer qu’il marche et produit des réservations. Etant propriétaire d’hôtel en parallèle je sais ce que cela veut dire de gérer un hôtel et de payer les factures à la fin du mois. Donc je suis doublement motivé pour m’assurer que nos sites font des réservations pour les hôtels. Qui sont les clients WIHP / Lookotel ? Les hôtels indépendants qui veulent changer le pourcentage de remplissage fait en direct. Quel peut être l’intérêt d’un hôtelier de rejoindre WIHP / Lookotel ? Si un hôtelier veut espérer arriver à 40 voir 60% de remplissage en direct avec son site web, il a un grand intérêt à faire un site avec WIHP. Quels sont vos prochains axes de développement ou produits ? Les sites web sont en évolution constante. Chaque nouveau site est diffèrent et contient de la nouvelle technologie. On vient de lancer un nouveau module de site pour mobile/iphone, et suite à notre expérience de vente de chambres à travers les réseaux sociaux et le web 2.0 on a découvert de nouvelles options que l’on est en train d’intégrer sur nos sites et nos portails. Et pour le reste… ça sera une surprise dès que nous serons prêts. The MICE Report, a magazine for the MICE industry (Meetings, Incentives, Conventions and Exhibitions) has an article about WIHP that Cliff James wrote. I thought you may find it interesting and it gives a great overview on what we do and how we do it. With independent hotels currently being charged an average 20% commission on reservations made through online booking agencies, hoteliers are seeking new ways to recoup their revenue. A commission-free solution is now at hand, as the marketing specialist company WIHP provides comprehensive strategies to help hotels increase their direct income. Cliff James talks to WIHP’s General Manager, Vincent Ramelli, about a commission-free future for hoteliers. Vincent Ramelli understands the nuances of the hotel industry. As the owner of two successful boutique hotels, he has firsthand knowledge of the vagaries of the hospitality trade – in particular, the often exorbitant fees charged by online travel agencies for internet bookings. However, the route he took to becoming an hotelier included substantial careers in marketing and web promotion. 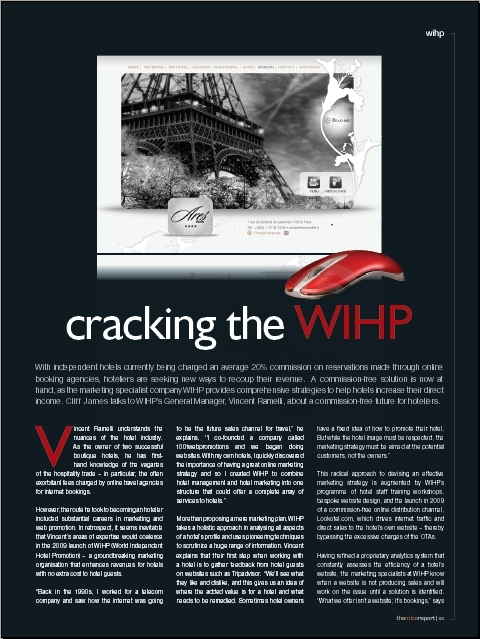 In retrospect, it seems inevitable that Vincent’s areas of expertise would coalesce in the 2009 launch of WIHP (World Independent Hotel Promotion) – a groundbreaking marketing organisation that enhances revenues for hotels with no extra cost to hotel guests. This radical approach to devising an effective marketing strategy is augmented by WIHP’s programme of hotel staff training workshops, bespoke website design, and the launch in 2009 of a commission-free online distribution channel, Lookotel.com, which drives internet traffic and direct sales to the hotel’s own website – thereby bypassing the excessive charges of the OTAs. Having refined a proprietary analytics system that constantly assesses the efficiency of a hotel’s website, the marketing specialists at WIHP know when a website is not producing sales and will work on the issue until a solution is identified. “What we offer isn’t a website; it’s bookings,” says Vincent, drawing upon his substantial experience in web promotion. “If there are no results, we review our actions and adjust them until they work – and that’s the way with all our products. Having been on the receiving side, we know what hotels need. As a hotel owner himself, Vincent’s own experiences have informed the quality of service provided by WIHP. He reveals that the company’s vision is to assist other hoteliers market their properties and take their share of the pie in direct bookings, whether that be through website enhancement, search engine optimization, payper-click advertising, offline marketing or through the lookotel.com distribution channel. Based upon the company’s impressive growth within its first year, WIHP’s specialist approach is proving immensely popular, with more than 350 independent boutique and luxury hotels in various countries already benefiting from the service. In Paris alone, WIHP makes more than 15,000 commission-free bookings for celebrated venues such as Hotel de l’Abbaye, Hotel Ares Eiffel and The Five Hotel. Vincent Ramelli maintains that hotels are opting for this specialist marketing service because it bears greater return on investment than the alternative. “WIHP provides a bespoke website for around €9000, depending on the options that the hotelier wants to add,” he explains. “Membership of lookotel.com starts at €50 a month, and our marketing management and social marketing campaigns begin at €1500 per month. Was at ITB last week (as a visitor this year, not an exhibitor) and it was great. Met up with some great people from the industry Sabre, TravelCLICK, Availpro, Pegasus and many others. ITB is fun, but it’s huge. It just goes on and on. Well us being in the tech industry with WIHP (World Independent Hotels Promotions) we were mainly in the halls 8 and 9. It’s always great to connect up with the industry like this, get a fresh idea of what is happening out there from many many perspectives at the same time. I found it interesting how Iphone and Android applications were the latest and greatest. Of course it’s a great feature – we’re doing mobile versions of our hotel websites and I know how important it is to be present on all the markets. But I just cant picture myself in the metro pulling out my credit card in order to pay my hotel rooms “on the go” and frankly I haven’t seen anyone do it either. Maybe we could get a payment system that goes through a mobile version of paypal like iTunes, that could work. But as far as I can see Mobile sites are a great way to present the hotel, well sized photos, good information, proper maps etc are vital. It’s the showpiece, and they’ll bookmark the hotel and reserve from home. In any case, I loved ITB and look forward to going to London soon for WTM. PS: Couldn’t find what ITB means, is it International Travel Berlin? if you know drop a comment below. It has been a pretty busy time since I last posted. Back in November we were still warming up for the launch of Lookotel.com and since then it has been just flat out travelling, seeing (great) people, meeting the hoteliers, and other industry people. And a lot more. But I thought I should catch up with everyone and start posting again. After the launch, here is the article in Hotels Magazine that appeared and I’m pretty happy with it. PARIS: 17 November 2009, WIHP (World Indernational Hotel Promotion) launched their website Lookotel.com as the new way to promote your hotel online, commission free. At the event some of the guests present were owner of Mr. Lafortune from Hotel de l’Abbaye, Mr Vaurs and Mr Sauvage, creators and owners of Hotel The Five and Le Hidden, The Kouana family owners of Le Modern and others. Fabrice Affuta from Hotel Napoleon and more. Lookotel already was a big hit for the Paris sector with great results on Google searches. The site won immediate approval from Parisian hoteliers as a great alternative to OTAs and other commission based sites. 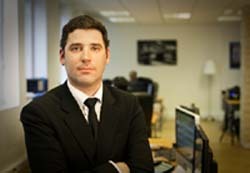 Lookotel.com pledged to the Parisian hoteliers to remain commission free and to always drive traffic to their websites for direct sales in exchange for a subscription fee that hoteliers pay. – 500% increased visitors in less than one year. From 280,000 to 1,600,240 page views. At the event Mr Ramelli creator of Lookotel, launched Lookotel.com for the international market. A new subscription system was implemented with different levels of membership for increasing services and a free 4 month trial for any new subscribers. Will be back with more news hopefully more regularly.